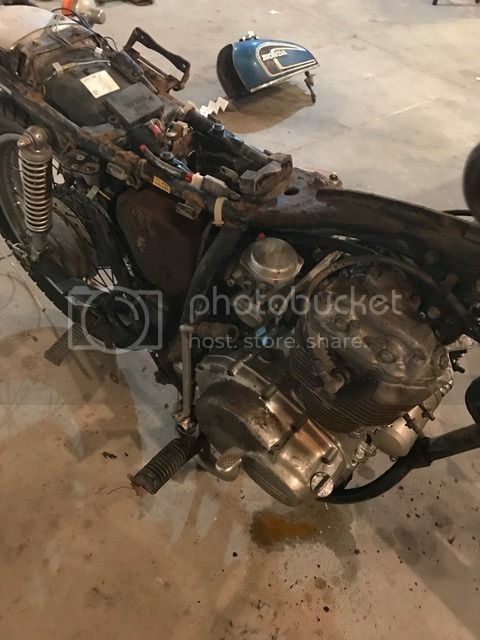 I've decided to dive in and start building a scrambler that I've been wanting to do for a couple years and have a 1974 CB360 as a canvas. 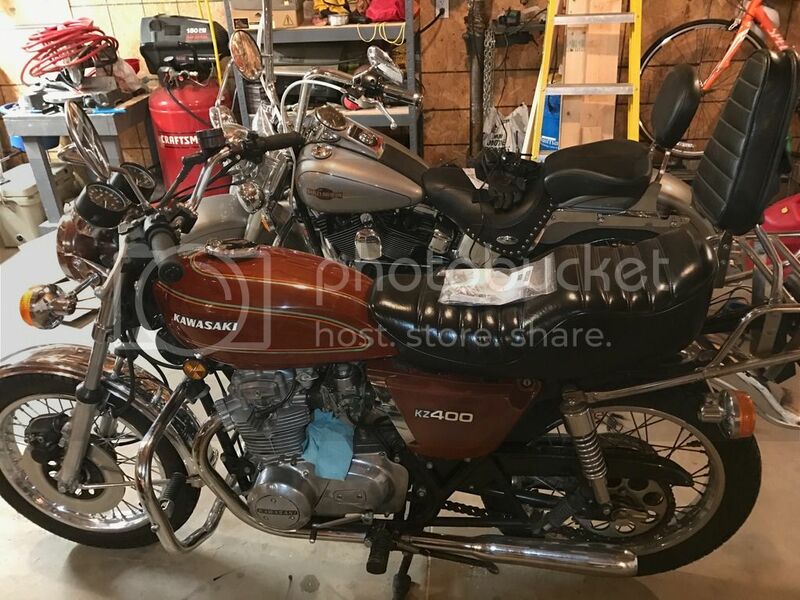 I picked up a KZ400 earlier this week to tinker with over winter. 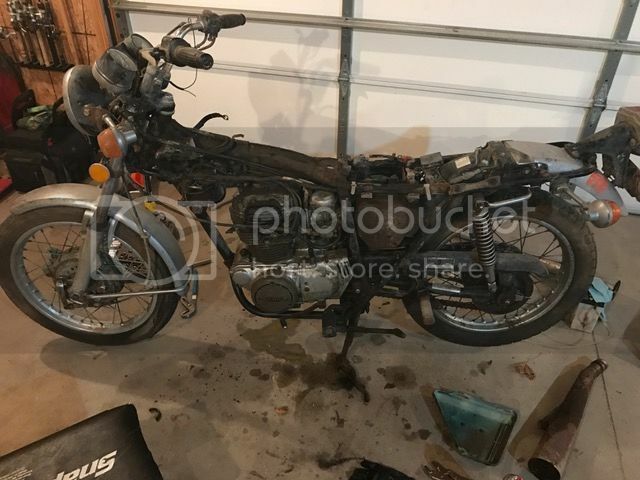 The bike is all original and in pretty good shape, so I didn't want to chop that one up. 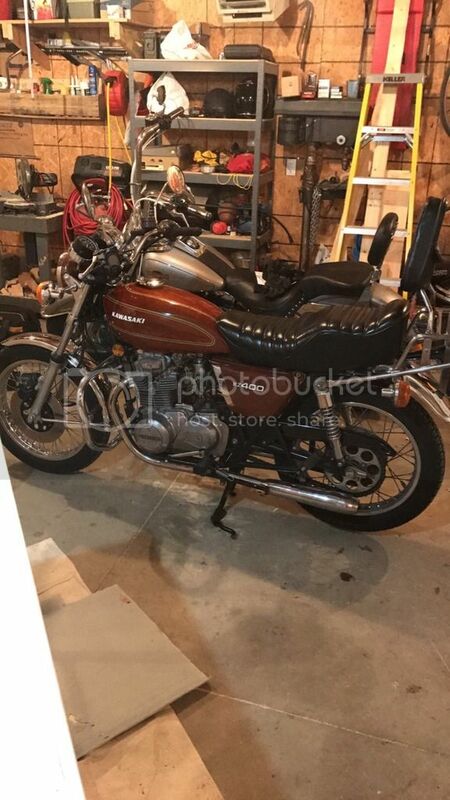 I was telling my father in law that I picked up the KZ, and he goes "if you want a project bike I have an old CB360 in the barn you can have"The bike was parked in 1985 for no other reason than he didn't feel like riding it anymore, and there it sat until today. 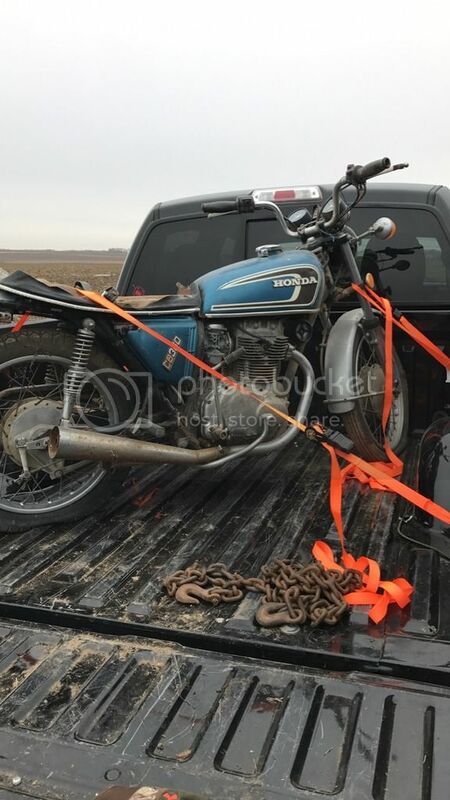 The bike was sitting in the bed of a 1969 Chevy pickup, (which will probably be another project down the road), we moved a couple old engines that had piled up over the years, wrapped a chain around the bike, and lifted it out with a skid loader and dropped it into the bed of my truck. It's pretty much all there. 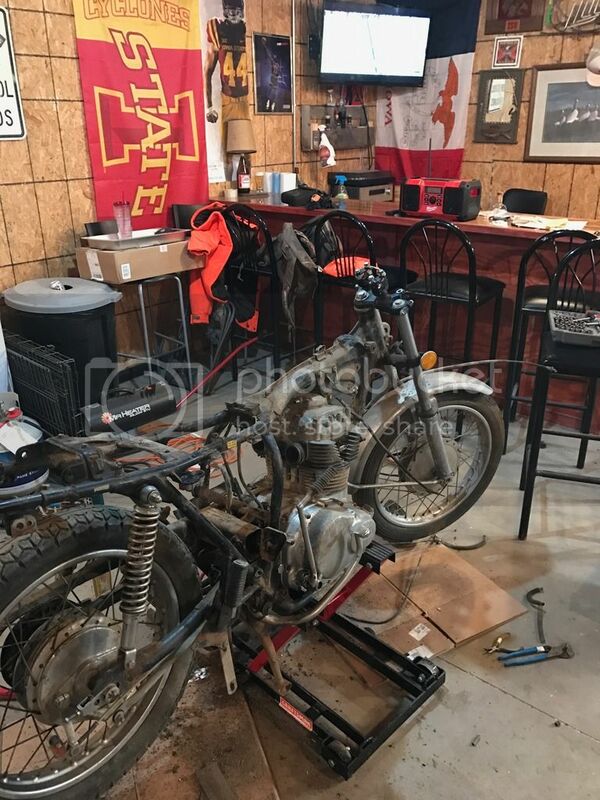 Inside of the tank isn't to bad, the bike is a little rough from sitting in a barn in Iowa for 30 years, but overall not terrible. The motor turns over freely and feels like it has pretty good compression still. I'll be testing compression this week. 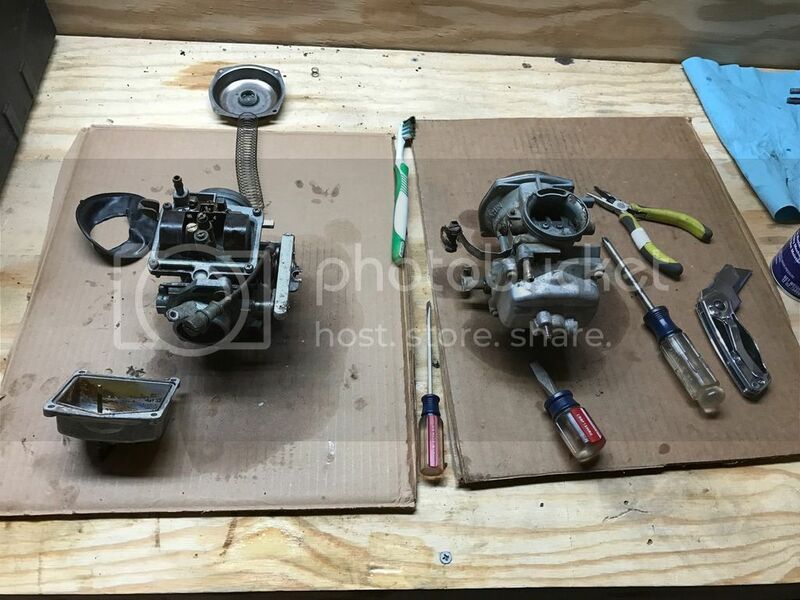 My gut tells me that I should probably tear the motor apart and rebuild with fresh gaskets and everything, but do you guys think this is necessary? Nice score on both of these guys. Nice score, man. You should throw up some pics of the 69 too! Good deal. For the 360 you may just want to pull the rocker cover off and check the health of the camshaft and journals. It's a common problem on the 360. There are a few oil mods that can be done to improve oiling to the head. Check crazypj's 360 thread for lots of good info on the mods. Check the compression on both cylinders. You may have stuck rings since it's been sitting for so long, but if compression is good then I'd leave it alone. Thanks guys! That 69 is pretty rough and I didn't get any pictures of it. Not much to look at though. I love the KZ so far. For whatever reason I just think they are sweet bikes. It has 13000 miles and I picked it up for $750. Adjusted the clutch and it runs like a champ. I ordered new air box and intake boots so that will happen later this week or next, then i'll just need to polish and clean and it'll be ready for summer. Anyways, I got the KZ back together this morning so decided to start tearing into the CB since I have the day off. I got the exhaust and tank off, and man, it's unbelievable how much dirt there is on this thing. I tried giving it a spray down with the hose to knock some of it off before I started tearing it apart, but it just turned a lot of the dust to mud. So thats awesome. The exhaust valves don't look to bad. Some carbon build up but they do move freely when I crank it over. The wiring harness looks to be completely intact and doesn't look like it has been chewed up at all by mice or anything. The oil in the crank case hasn't turned to sludge from looking through the oil fill hole, so that's a bonus. Seems like the carbs are froze up. 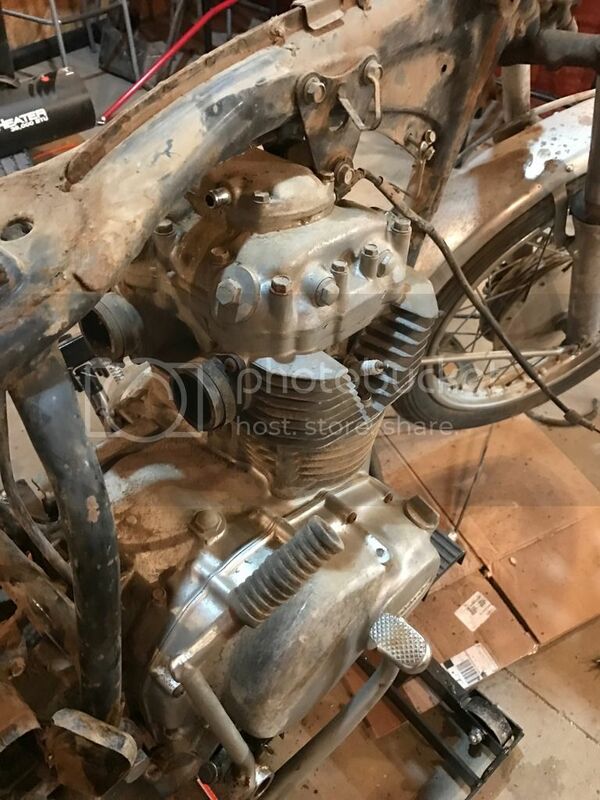 Throttle doesn't twist, and I know the cables are moving because I can see them trying to open the carbs but they won't move. The choke is also froze up. Front and rear brakes both work, but the clutch is also froze up. I'm not sure if the clutch plates themselves are stuck or if it's the cable. I'm leaning towards clutch plates. It also looks like both recalls were completed on this bike from seeing the two punch marks on the motor vin#. Here's a few pictures of disassembly so far today. I'm going to get it down to bare frame then start putting it all back together to see if it'll run. 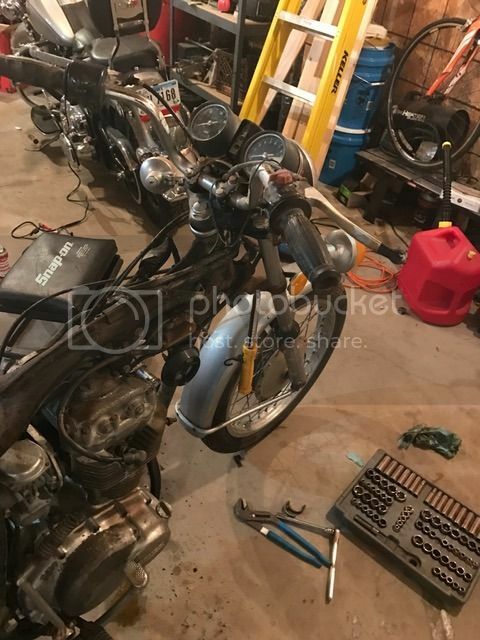 If it'll run, then I'll start with the scrambler conversion. I have access to free powder coating so fenders, frame, swingarm, pretty much everything is going to get coated. Finally had time to continue the tear down. It's been pretty cold here and when temps are in the single digits and the wind is blowing the heater in my garage can't quite keep up. 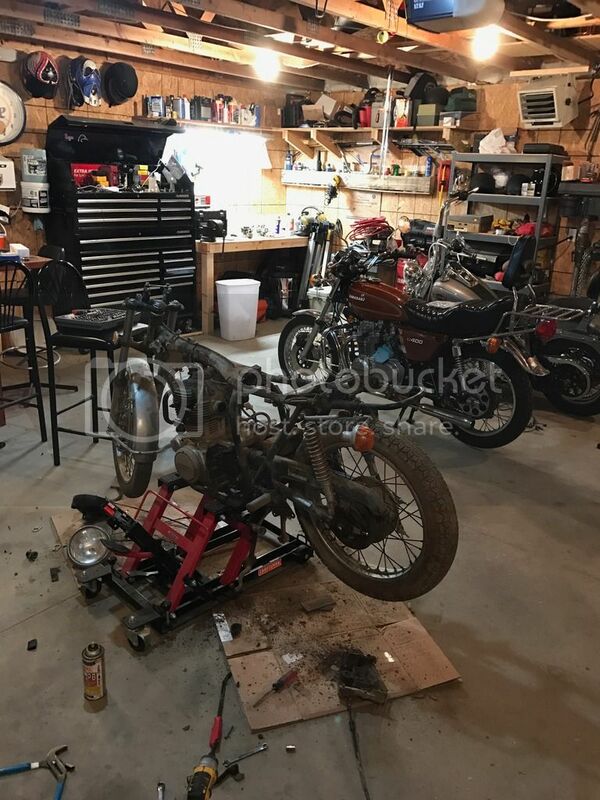 I got the bike pretty well all torn down to motor, frame, and wheels. I was happy to find the wiring harness was completely in tact. It didn't look like any mice had chewed through anything which is surprising. Everything came apart for the most part pretty easily with the help of a little PB blaster. Nothing rusted to bad and only stripped one screw. I have no clue why they used phillips head screws on everything back then. Hex head would be been so much nicer. 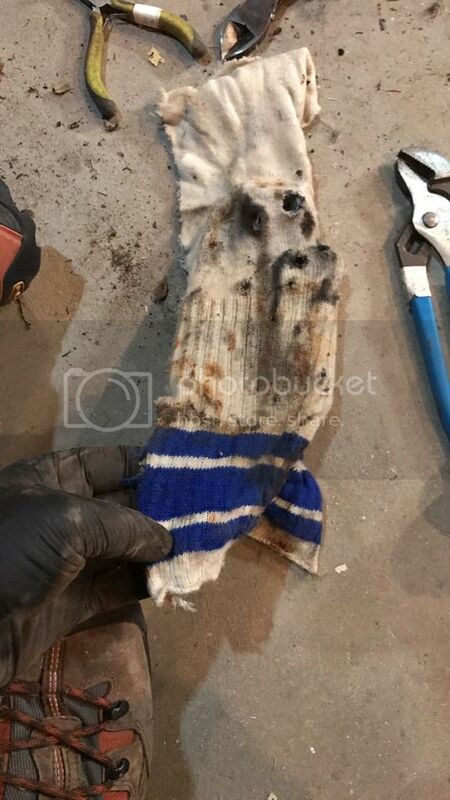 Found a bonus tube sock that had the toolkit in it. My father in law said it was from about 1980 lol. This engine is ridiculously dirty. It's probably over an 1/8th inch of dirt/mud on it. I think the PBblaster soaked into it and made it worse. Does anyone have any suggestions on how to clean this thing? 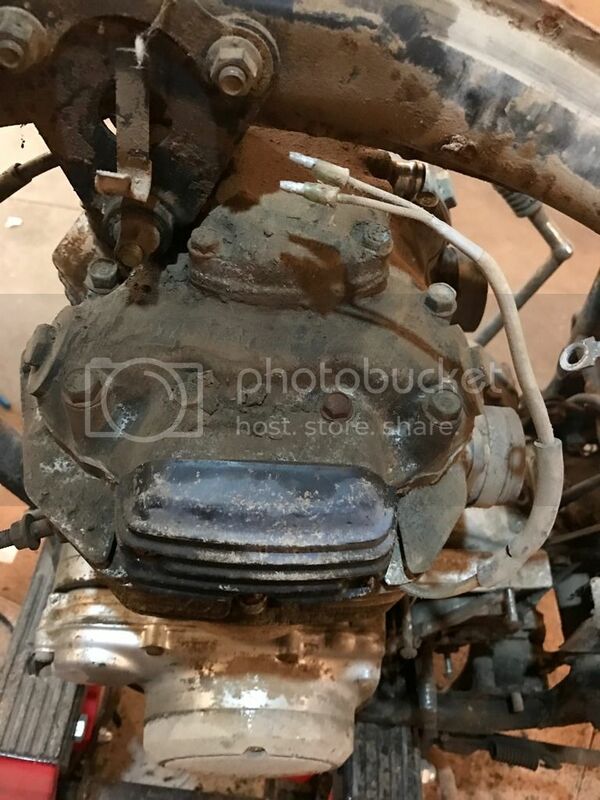 put the exhaust back on, plug the intake with plastic and rubber bands and power wash it? I'd be afraid of getting water through a gasket or something though. 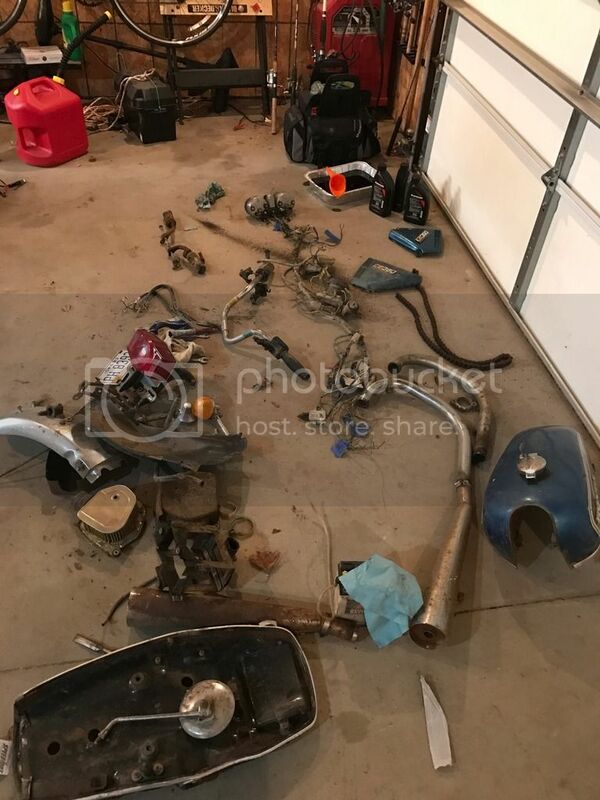 Starting to get quite the bone yard of parts, about the only reusable is the exhaust headers, hand controls, and wiring harness and fuel tank. 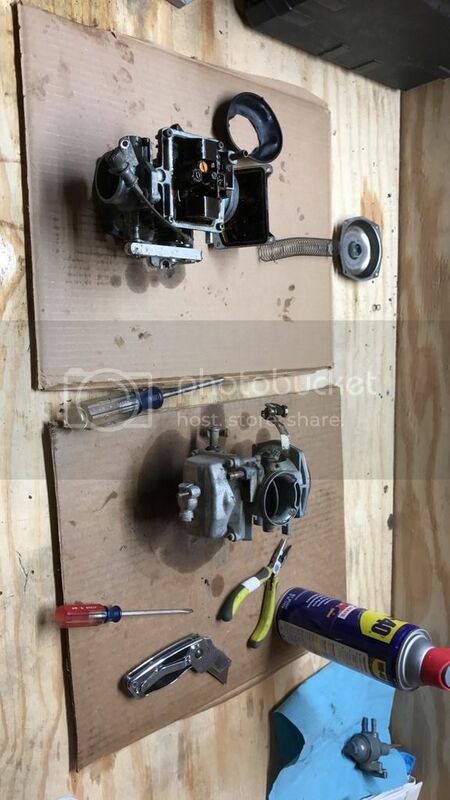 Started dissassembly of the carbs. They are pretty bad. The diaphragm was tore and when I touched it it tore more. Is the slide supposed to slide out? I couldn't get the thing to move, but didn't want to force anything as I don't know carbs from hole in the ground. I also had time to replace the Petcock on the KZ and install some fuel filters on it. 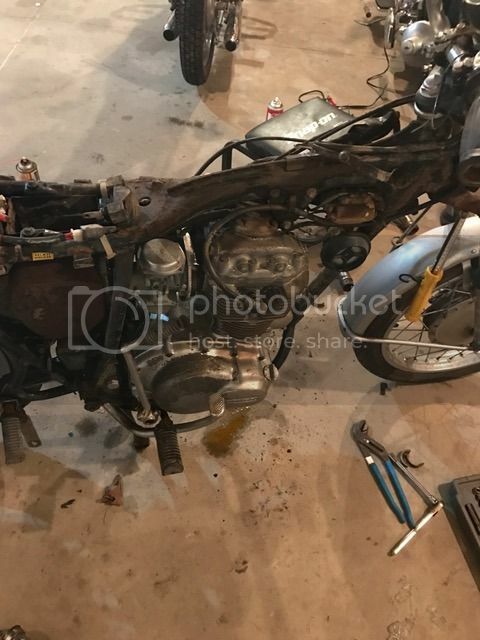 I hope to get it stripped to the bare frame this weekend so I can power wash and start the long and slow rebuild process. The carb slides should definitely come right out. To clean the motor, simple glean, elbow grease, and toothbrushes/wire brushes. Seized slides are a PITA. Soak them in PB blaster for a few days before you even try getting them out. 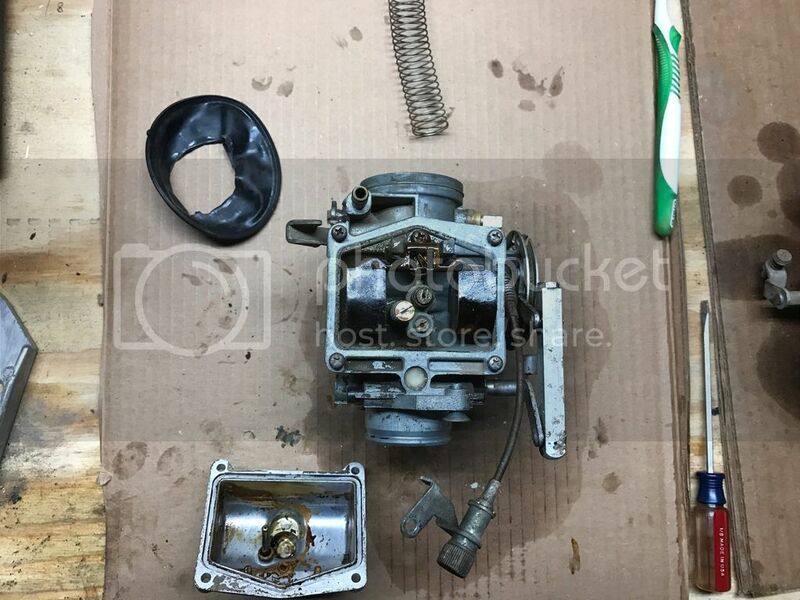 I had to put the XL carb in a vice and yank it out with a piece of wire and pliers as a lever. Thanks for the input. Next chance I have to work on the bike will be Friday night and I'll try to get the slides out of the carbs. What's the best method to clean these things up? I know I've read about people boiling in lemon juice etc, but is there a method that's better than another for carbs this bad? Nice bikes man! I love my Harbor freight ultrasonic cleaner for carbs. Hot simple green sonically cleaning while I work on other tasks. For dirty motors I normally bucket hot water on them, brush, rinse repeat then blow off with blower. For grease I spray super clean undiluted, let soak and lots of various brushes.